The hope for an ambitious climate change bill that will give birth to a transformed development pathway for different countries has increased, as world leaders meet in Paris Conference of the Parties (COP21). While the talks are ongoing, the world looks to the COP21 to deliver a new climate agreement that will be realistic and reduce the effect of climate change on different continents of the world, especially Africa. Success at COP21 can drive and accelerate the transition to a cleaner, healthier and more secure future, locking-in sustainable economic growth and development. Participants at the conference say a low-carbon, climate resilient world by the end of this century is no longer a hope but a necessity. 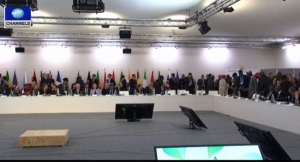 Talks on how to reduce the effect of climate change topped talks at the conference. On the sideline of the ongoing COP21 meeting in Paris, the United Nation’s Secretary General, Mr Ban Ki-moon, held a high-level meeting on Africa and climate change. Mr Ban said Africa was particularly vulnerable to the effects of climate change, where much of the economy depended on a climate-sensitive natural resource base, including rain-fed subsistence agriculture. “Disruptions in food or water supplies pose serious risk not only for your economies but also for political stability, particularly in fragile states,” Mr Ban said. He, however, stated that African countries had shown great determination and vision in attempting to reduce poverty and meet demands for growth without jeopardising sustainability. The World Bank President and the President of the African Development Bank, Dr Akinwunmi Adesina, said Africa had every reason to complain, stressing the continent had been short-changed by climate change. “We must not abandon Africa. Africa must not be short-changed in climate finance,” Dr Adesina stressed. One message that is common in the series of the meetings by different African leaders at the conference is to see the huge effect of pollution by other continents on Africa corrected through a profitable climate deal for Africa.